Thank you A. G. for your lovely comment on Trip Advisor. Our goal is to make your holidays as perfect as you expected. As you highlight it, our villas fit perfectly to important group of family or friends. 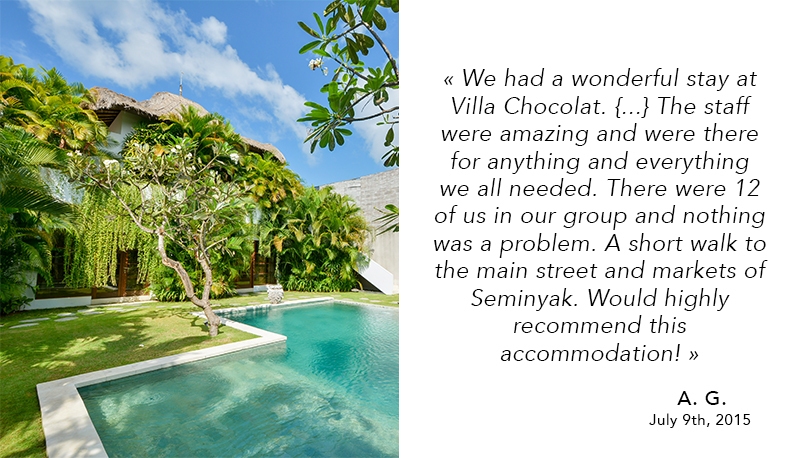 So, if you want to spend luxury sunny vacations, the Villas Chocolat offer you the opportunity to be reunited with your beloved ones in the island of Gods, near all the fancy restaurants of Seminyak, and the white sand beach. Why don’t you have a look on our properties?